Attend THE NBM SHOW as well, it is included with your registration! In order to thrive in today's ever-changing world, embroidery and apparel decoration professionals need to be forward-looking. The NNEP's Embroidery & Digitizing Conference will help you master the skills to ensure that your business will have the agility and ability to thrive, not just survive. By attending these classes, you will have the opportunity to learn from leaders in the industry. Embroidery and apparel decoration business owners will benefit. The program provides immediately applicable industry-specific knowledge to help you improve your profits, production workflow and digitizing abilities. Be able to create maximum impact with applique designs that dramatically reduce stitch counts while increasing the overall impact of the design. We want to help you make the right choice for your professional development, so please contact us at 800-866-7396 or embdigconf@nnep.com for personal assistance. Attend any of the classes at NNEP's Embroidery & Digitizing Conference on Thursday and Saturday. You DO need to register to attend each specific class of the conference, as there is limited seating in each classroom. Classes descriptions* are listed below. Download the schedule here: NNEP's Embroidery & Digitizing Conference Class Schedule. Frank's Class Description: What elements make a design run poorly? All designs should run smoothly, with very few thread breaks. Learn how to digitize/edit designs with these principles in mind and create "high performance" designs. Erich's Class Description: The common mistakes that everyone makes can lead to discoveries that make your embroidery special. Learn how to turn problems into triumphs. We will take a design that looks good on the screen but runs badly, and turn it into a design that is a pleasure to run and puts a smile on your customer’s face. How small is too small, Learn how to make a small letter work for you. Learn how to create large letters that will be effective, easy to run, and will stand up to wear. Learn how to add volume to your letters without foam. Learn basic letter construction, what works and what does not, and how to hide travel stitches between your letters. Working with performance fabrics. Learn what your stitches are doing and how to make sure they are effective on the garment you are using. Learn the effective use of underlays, what works and what does not. Learn the density to use and how extra stitches will impact the integrity of your design. Pricing is one of the topics we cover the most often with NNEP members and new embroidery professionals. Many embroiderers & apparel decorators are not sure where or how to set their pricing. Many new embroidery business owners guess, hoping for the best… You will never have to do that after today! I will give you a blueprint to help you develop a pricing structure for your embroidery & apparel decoration business. This will prove to be informative for you, by either confirming your existing pricing or by motivating you to refine your prices so that you are indeed making the profit in your business that you desire. Class attendees get: the Pricing Worksheet, the Job Profit Calculator and a customized spreadsheet to plug in numbers and generate prices easily. Presented by Frank Gawronski, Embroidery Educational Services Int'l. Learn the basics of Embroidery machine maintenance. We will explore "How" the machine works and discuss simple fixes for any operator/owner. Thread tensioning is a very important operator skill set. Learn how tensions work and how to set them with confidence. From set up to finished product we'll take you through the Do's and Don't of a successful distressed or traditional applique layout. Franks' Class Description: Learn the basics of embroidery digitizing. Learn how "Auto digitizing" works. Learn the basic digitizing parameters; stitch length, density and how to use underlay. We will also explore the proper level of digitizing package that’s right for you. Erich's Class Description: What you need to buy, what you need to know. What to ask for in a machine, and what to ask for in your software. Learn what support you will need, and what training, so that it all works for you, and get a firm foundation that will last as you grow in your new profession. Oh, what I would not give to have had the tips and techniques I am going to share here back when I was just getting started in our business! If there was a right way, and a wrong or expensive way to do something, you know that I picked NOT the best way, practically every single time. From how to prepare for sales calls, how to provide quotes to your customers, how to follow up with them, how to design your workspace, how to manage your time, and how to plan and prepare for the best and worst case scenarios - after this session, you will not have to personally experience the expensive (time wise or with your own money) mistakes that many people make. Accelerate your learning curve and your road to success by learning from our mistakes instead of living through them yourself. Class attendees get: Cold calling sales script, Secret Agent Joe Logo Strategy, Limits of Liability Samples. What will work when you turn that printed design into an embroidered design and what will not. Learn your limitations, and learn how to take those limitations and turn them into features that your customer will love. Learn how the various Thread Tensioning systems on your embroidery machine work and discover how to adjust them with ease and confidence. Learn how to troubleshoot those nagging problems that often lead to unnecessary thread breaks, thread looping, puckered designs and even damaged garments. Sharpen these important skill sets and bring more money to your bottom line. Please Note: CALL to register for this specific class, or register for it AT the CONFERENCE, as it is a last minute schedule change! *Class dates, times, presenters and subjects are subject to change without prior notice. All class participants will also be registered to attend THE NBM SHOW and must be at least 12 years old. No exceptions! The NNEP's Embroidery & Digitizing Conference is co-located with THE NBM SHOW in Indianapolis in September. That means when you register to attend any classes at the Conference, you also will be registered for THE NBM SHOW going on at the same time, for no additional cost! What will you discover at THE NBM SHOW? Click HERE to go to THE NBM SHOW website. 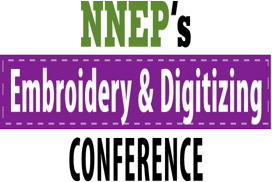 NNEP's Embroidery & Digitizing Conference Schedule - click here! Come to the Conference ready to discover better ways to make your business successful and to the Trade Show ready to do business with the suppliers. Keep in mind that by registering for this event you are giving consent to the participating vendors at THE NBM SHOW and the NNEP to send you information about their products and/or services. Please note: all young and future apparel decorators must be at least 12 years old and registered to attend the classes or enter the exhibit hall. No exceptions. NNEP's Embroidery & Digitizing Conference attendees stay and save at the Westin Indianapolis, which is connected to the Indiana Convention Center by a skywalk. The group rate is $179 Standard. Group Rate Discount Deadline: August 9, 2018. Parking: $30/$42 valet; rates subject to change. Whether you’re attending a convention, exploring the city, or a combination of both, you’ll find you can access many attractions on foot. Walk to Lucas Oil Stadium for a Colts game, or head to Banker’s Life Fieldhouse for a concert. Art aficionados and history buffs alike will find one of the best Native American and Western art collections in the world at the Eiteljorg Museum of American Indians and Western Art. If you’re traveling with children, the Indianapolis Zoo is a must-see and is also within walking distance of the hotel. Visit the Convention Center's Parking & Directions page HERE for details. Get recognition for the industry-specific knowledge and expertise you acquire at NNEP's Embroidery & Digitizing Conference! Every one of the classes counts towards your participation in the professional development program. You can even include your attendance at THE NBM SHOW!